Dylan Marron on the TED stage. 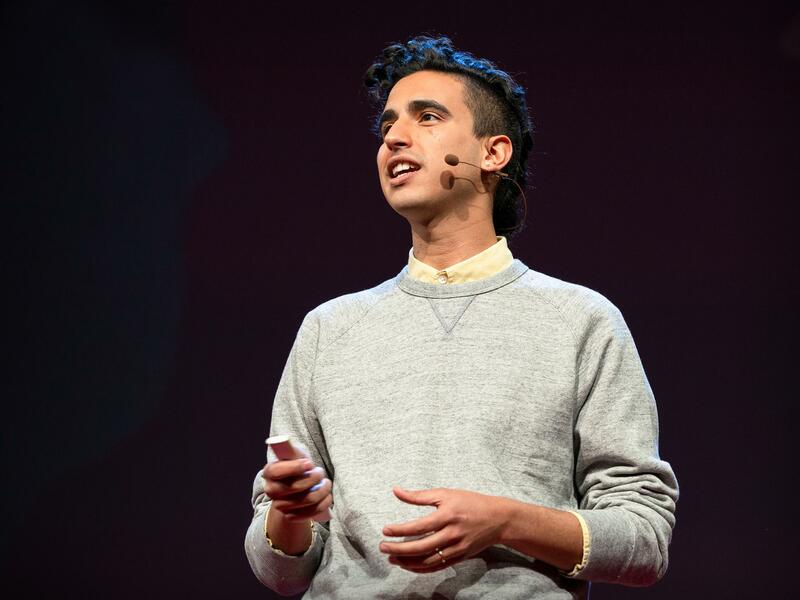 Dylan Marron is a digital creator and host of the podcast Conversations With People Who Hate Me — a show where Marron calls up people who have sent him hate mail to ask, "Why did you write that?" Marron was previously an editor for Every Single Word, a video series that edits down popular films to only the words spoken by people of color. To address anti-trans bathroom bills, he created and hosted a video series, Sitting in Bathrooms with Trans People. He is also the voice of Carlos on the podcast Welcome to Night Vale. So can you go ahead and introduce yourself, please? DYLAN MARRON: My name is Dylan Marron, and I host and produce the podcast "Conversations With People Who Hate Me." RAZ: And we'll come back to Dylan's podcast in a minute, but to understand why he started it, you have to first understand the kind of videos Dylan makes and posts online. UNIDENTIFIED ACTOR #1: (As character) Mr. Vance would like to see you in his office. UNIDENTIFIED ACTOR #2: (As character) Son, you're going to have to exit the vehicle. MARRON: As a way to respond to the transphobic bathroom bills, I hosted and produced an interview series called Sitting In Bathrooms With Trans People. MARRON: Welcome back to Sitting In Bathrooms With Trans People. I am here with trans icon Kate Bornstein. I also created a satirical series called Unboxing, where I satirized the real unboxing videos where YouTubers, you know, crack open the latest electronic gadget, and instead, unboxed intangible ideologies. MARRON: Here's a product as old as the country that made it. Today, I'm unboxing the mistreatment of Native Americans. This product is actually really durable. And because a lot of those videos went viral, naturally, you're going to get people who really don't like it. RAZ: And, of course, Dylan started to see a lot of Internet hate. Here's Dylan Marron on the TED stage. MARRON: I was called everything from beta to snowflake and, of course, the ever-popular cuck. So beta, for those of you unfamiliar, is shorthand online lingo for beta male. But let's be real. I wear pearl earrings, and my fashion aesthetic is rich white woman running errands, so I'm not angling to be an alpha. MARRON: Doesn't totally work. Now, snowflake is put-down for people who are sensitive and believe themselves to be unique. And I'm a millennial and an only child, so da. Let's take a look at some of this negativity in action. Sometimes it's direct, like Marcos (ph), who wrote - you're everything I hate in a human being. Others are more concise, like Donovan (ph), who wrote - gaywad (ph) fag. Now, I do need to point out Donovan is not wrong, OK. In fact, he's right on both counts. So credit where credit is due. Thank you, Donovan. It's fun to talk about these messages now, and it's cathartic to laugh at them. But I can tell you that it really does not feel good to receive them. So over time, I developed an unexpected coping mechanism. Because most of these messages I received were through social media, I could often click on the profile picture of the person who sent them and learn everything about them. I could see pictures they were tagged in, posts they'd written, memes they'd shared. And somehow seeing that it was a human on the other side of the screen made me feel a little better. Still, that didn't feel like enough. So I called some of them, only the ones I felt safe talking to, with a simple opening question - why did you write that? RAZ: So you were attempting to understand these people who were writing such hateful things to you. And then, I guess, you recorded some of these conversations, and that kind of grew into a podcast? MARRON: Yeah. I actually, like, the first person I spoke to was a guy named Josh (ph), who had written to tell me that I was a moron and that being gay was a sin, also that I was the reason this country was dividing itself. But just hearing him and hearing how all the ways that he's a, you know, full three-dimensional human was like, oh, my God, I want to do this with so many people. MARRON: Josh, you said that you're about to graduate high school. How is high school for you? JOSH: It was hell (laughter). JOSH: When you're different, then you're not well-liked. And I'm a little bit chubbier than a lot of people. And people seem to judge me before they get to know me. MARRON: I mean, I also just want to let you know, Josh, I was bullied in high school too. Do you feel that we're similar, or do you feel like that's an unfair assertion? JOSH: I think we're similar. We have similar lives, but very different beliefs. You're bullied, I'm bullied, but it's not the same. MARRON: And just because we share that common experience does not mean that suddenly the world is healed, but it does mean like, maybe there are more people who wrote a very negative comment and they are willing to talk. RAZ: In just a moment, how simply listening to his haters became Dylan's way to fight hate itself. Stay with us. I'm Guy Raz, and you're listening to the TED Radio Hour from NPR. RAZ: It's the TED Radio Hour from NPR. I'm Guy Raz. And on the show today, Why We Hate. And we were just hearing from Dylan Marron. He started a podcast where he talks to people who've written some pretty hateful things about him online. MARRON: My guests get to dictate their own levels of anonymity. I'm not calling them and secretly recording them and then releasing it because I want to be super clear. This is not a podcast to expose you. This is a podcast where you and I are going to have nuanced conversation about - we'll start with why you wrote what you wrote me, but then let's go into other stuff. MARRON: So, Bradley (ph), what urged you to write me that initial message? BRADLEY: I'd actually messages a few different popular people on Facebook and I was really struggling really heavily with depression at the time. And so I was at a point where it's like, hey, does my voice even count? Does my voice even matter? MARRON: I mean, Bradley, I totally relate to that. UNIDENTIFIED PERSON #1: It's kind of difficult sometimes to - it's more difficult to come out as not a liberal than it is to come out as gay nowadays. MARRON: As a member of the LGBT community, I would disagree, but I'm also not a member of the right-leaning community, so I've never had to tearfully tell my parents that I identify as right-leaning, you know? UNIDENTIFIED PERSON #1: OK. You got me there. MARRON: Is there anything that you're going to do differently now that we've had this conversation? UNIDENTIFIED PERSON #2: I tell you what - I'm going to listen because it's important. MARRON: Before I started this project, I thought that the real way to bring about change was to shut down opposing viewpoints through epically worded video essays and comments and posts. But I soon learned those were only cheered on by the people who already agreed with me. Sometimes the most subversive thing you could do was to actually speak with the people you disagreed with and not simply at them. Now, in every one of my calls, I always ask my guests to tell me about themselves. And empathy, it turns out, is a key ingredient in getting these conversations off the ground. But it can feel very vulnerable to be empathizing with someone you profoundly disagree with. So I established a helpful mantra for myself - empathy is not endorsement. I also want to be super clear about something. This is not a prescription for activism. I understand that some people don't feel safe talking to their detractors and others feel so marginalized that they justifiably don't feel that they have any empathy to give. I totally get that. This is just what I feel well-suited to do. RAZ: So what's the goal? Is the goal to dehumanize them, to get them to stop hating you, to come to an understanding? Is there any goal? MARRON: Yeah. I mean, the goal is to see if conversation is possible, and often it is. I think we all have the capacity to hate, and I think that conversation - dialogue - is a way to disarm that hate. MARRON: Am I under any delusion that this podcast will singlehandedly heal a very divided country? Not at all (laughter) you know? Like, I don't think that, like, this is the only way we're going to get out of this. But anyone who goes on the Internet will see a negative comment, a negative tweet, a negative post. I just want to see if that post, if that comment, if that message, can be the start of a conversation rather than the end of one. And I've found that in many cases it really can be. MARRON: You know, I've reached out to a lot of people for this podcast. And some have politely declined. Others have read my message and ignored it. Some have blocked me automatically when I sent the invitation. And one guy actually agreed to do it, and then five minutes into the call, hung up on me. I'm also aware that this talk will appear on the Internet, and with the Internet comes comments sections, and with comments sections inevitably comes hate. So as you're watching this talk, you can feel free to call me whatever you'd like. You can call me a gaywad, a snowflake, a cuck, a beta or everything wrong with liberalism. But just know that if you do, I may ask you to talk. And if you refuse or agree and hang up on me, then maybe, babe, the snowflake is you. Thank you so much. RAZ: Dylan Marron - he's the host of the podcast "Conversations With People Who Hate Me." You can see his entire talk at ted.com. Transcript provided by NPR, Copyright NPR.